I don’t know anyone closely who is deaf but, when my parents reached their early eighties and their hearing began to decline, they both experienced difficulty in comprehending complex sentences. That, in turn impacted their ability to communicate. That’s when I began to think more about what it’s actually like to be hearing impaired and the range of issues associated with hearing. British theatre director Nina Raine’s Tribes, which had its Bay Area premiere at Berkeley Rep’s Thrust Stage on April 16, further opened my eyes. This engaging and very relevant family drama tackles hearing, partial hearing, deafness, and listening through the story of a family that can’t shut up long enough to hear much of anything. The action revolves around Billy, a young man who was born deaf and who has been raised in this overeducated and verbally combative family that considers learning sign language a sign of conformity or capitulation to otherness. Consequently, Billy reads lips and does not sign…until he falls in love with a woman who upends him and the entire family. Thoughtfully directed by Jonathan Moscone (artistic director of Cal Shakes and son of SF mayor George Moscone who was slain in 1978), Tribes represents Berkeley Rep at its finest—challenging our tightly held assumptions with realizations that keep coming for days afterwards. Speaking of assumptions, once I discovered that Nina Raine came from such solid stock—she is the grand niece of the great Russian poet, novelist, and Nobel laureate, Boris Pasternak, author of Doctor Zhivago (1954)—I assumed the play would be substantial fare. Tribes had its world premiere in 2010 at the Royal Court Theatre in London, earning an Olivier Award nomination for best play. The adult children, all twenty-something, live at home and suffer failure to launch. Ruth (Elizabeth Morton) is an aspiring opera singer who can only score singing gigs in pubs. Daniel (Dan Clegg) is a grad student continually rewriting his thesis on language. He stammers when caught by surprise and suffers from auditory hallucinations. Billy (James Caverly), the central character, was born deaf. 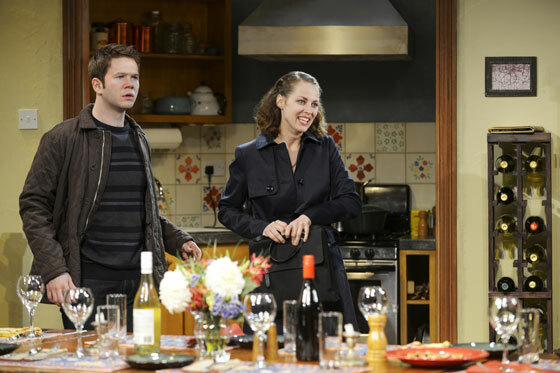 The play opens with a typical family dinner that establishes their communication dynamic as a nightmare of disconnection. It’s amusing to keep a running tally of all the non-compassionate listening infractions that occur while trying to stay on top of all the literary namedropping. We recognize immediately from Billy’s silence that his comprehension is limited. The family doesn’t accept this though. Over the years, they have refused to accommodate him or to really accept his deafness. Billy doesn’t know sign language because the family has always belittled it. He has adapted to them by learning to read their lips but even this has been challenging as it requires their willingness to participate, which they haven’t always been consistent about. On the up side, having spent his life isolated from the ruckus, Billy is the sweetest of the lot. Todd Rosenthal’s set is a lived-in dining and living room whose walls are lined with books, reinforcing the impression that this is a family that is book smart and but short on common sense and wisdom. The pot is stirred to a boil when Daniel meets Sylvia (Nell Geisslinger), who hears but is struggling with the early phases of adult-onset deafness. She learned sign language because she was raised in a deaf family. Eager to connect with Billy, she introduces him to the Deaf community and helps him with learning to sign and with getting a job that involves lip-reading and transcribing videotapes that are used as evidence in court. Not only does she serve as a great catalyst for Billy, she is tender and compassionate and remarkable young woman. One of the drama’s most gratifying moments comes when Billy begins to stand up to his family and to insist, from now on, that they communicate with him on his terms. But just he experiences empowerment and gets more immersed in the Deaf community, Sylvia becomes frustrated with its politics and insularity. We learn that while some deaf people feel cut off from the hearing world, or disabled, for others, being Deaf is a culture and a source of pride. (Capitalized “Deaf” denotes culture, as distinct from lowercase “deaf,” which describes a pathology.) Geisslinger anchors the entire production with her authentic performance as someone navigating her own identity issues while slowly embracing a world of non-hearing. Sylvia has grown up understanding from an early age the issues that Billy is tackling much later in life and the couple is both united and separated by this divide. 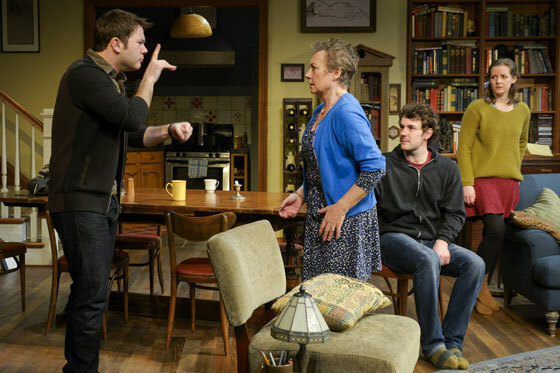 One of the play’s most powerful scenes occurs when Sylvia comes to meet the family and Christopher challenges her about the expressiveness of sign language—what it can and cannot do. She rises to the occasion, educating us all about its strengths and limitations, and matching him argumentatively blow for blow, never backing down. She also explains the implicit hierarchies of the Deaf which she finds hard to navigate–she was not deaf from birth so that makes her “less than” someone who was (Billy) but she was raised in a deaf family which gives her as edge. At which point Christopher asserts that the Deaf community is just like any other tribe that has rules about who it will and will not admit. James Caverly delivers an engaging Billy whose personal journey imparts a great deal of information about language and deafness. His lip-reading, for example, turns out to be an incredibly inexact tool and Raine has weaved this into the plot. (Since most lip movements are associated with more than one sound, the lip reader must guess and intuit in order to make sense of what is being said.) The play’s important take-away is the message that, if you know one language, you can go on to learn another. The learning process will show you how language defines systems of thought and reveal the biases implicit in the languages you are dealing with. The audience is forced to engage and to experience some dissatisfaction because not all of the sign language is translated with subtitles and not all of what Billy says is understandable. Is this an issue of translation? Are we then of a different tribe? The plays invites a lot of questions. Details: Tribes runs through May 18, 2014, at Berkeley Repertory Theatre’s Thrust Stage, 2025 Addison St., Berkeley. Performances are Tues-Sun with matinees on Sat, Sun and some Thurs. Tickets: $29 to $99. Discounts: Half-price tickets available for anyone under 30 years of age; $10 discount for students and seniors one hour before curtain. Tickets and info: www.berkeleyrep.org or phone: 510 647–2949. Parking: Paid parking is readily available at over 5 parking garages as close as one block from the theatre. The Allston Way Garage, 2061 Allston Way, between Milvia and Shattuck, offers $5 parking Tuesday–Friday after 6 PM.